Yes I shy away from feathers! And I'm really not all that taken with work that highlights them. But on the other hand it would be nice to be able to get an impression of what the feathers look like on individual species. So I keep at it. They're part of the beauty of birds so I'd like to get them in there somehow or other. Without making me lose my mind!! The lessers are really good. I love to watch yellowlegs feeding. So elegant - you captured them nicely. Thanks Ellen. 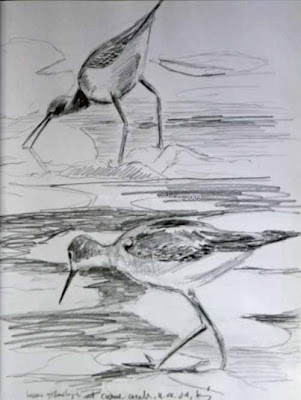 We saw some more Lesser Yellowlegs at Cape May/Brigantine recently where they are parading down the water all with their mouths open, hoping to catch some fish. I hope to do a drawing or painting soon to capture this less than elegant aspect of them! But most of the time they really are elegant. I'm happy to have captured a bit of that. Oops! The Lesser Yellowlegs remain elegant. I started doing some quick watercolors today of the Yellowlegs that were walking down a channel at Brigantine with mouths open gathering in whatever fish appeared. Inelegant behavior! 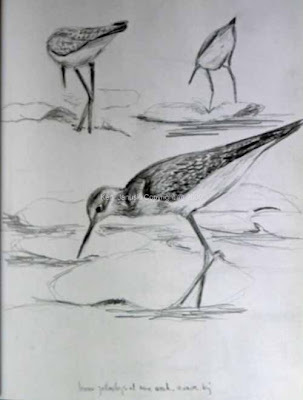 But as I worked on it I realized these were Greater Yellowlegs not Lesser!